MARC GT has shown off a striking new livery and major sponsorship ahead of their Liqui-Moly Bathurst 12 Hour campaign next week. WM Waste Management and TANA will support the car, to be driven by the experienced combo of Chaz Mostert, Mogan Haber and Max Twigg. The distinctive green and yellow livery will stand out amongst the bumper 55-plus field entered for the race and serves as a link to Mostert’s first ever Bathurst start. The Queenslander made his debut at the circuit in 2011 racing a Racer Industries-prepared HSV Astra VXR alongside Ash Walsh and Gerard McLeod- finishing third in class E. Mostert, of course, would go on to spectacularly win the 2014 Bathurst 1000 with a last-lap pass on an out-of-fuel Jamie Whincup. Mostert also won the 2016 Bathurst 6 Hour production car race, confirming his affinity with both the location and the brand he’ll race next week. Team boss Ryan McLeod welcomed the new sponsors to the squad, and said the team was ‘ready to go’ ahead of their B12hr debut in the outright class. “With the international running we have done with this car, combined with the local testing and the Bathurst test last year, we feel like we’re in good shape,” McLeod said. 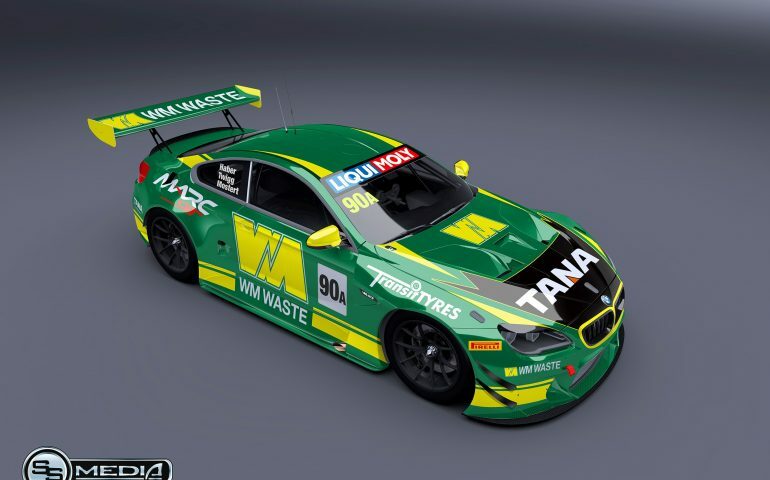 “The car looks sensational and it’s great to have WM Waste Management and TANA on board to support our Bathurst program. “We have been working on several key areas we think will help us improve, in particular efficiencies in braking and aero which are both very important for Bathurst. The M6 GT3 has lots of downforce and can struggle on the straight so it’s critical to pass cars with confidence so we’ve worked hard on the braking. McLeod said that despite the car being entered in the Am class – where only one ‘seeded’ driver (Mostert) is permitted – the team wasn’t ruling out a shot at the outright win all going to plan. “We’re of the mindset that if we can keep with the race until the 8 hour mark we will be in with a shot,” he explained. In addition to the MARC GT program, the sister MARC Cars Australia outfit will run six cars in the Invitational class, headlined by securing the driving talents of 2016 national racing champions including Will Brown, Leanne Tander, Beric Lynton and Jake Camilleri amongst a host of talented drivers. Click here to read about the full MARC Cars Australia squad.